GIS Day is a global event for users of Geographic Information Systems (GIS) to educate children and adults about how geography makes a difference in our lives and to demonstrate GIS technology. GIS Day events take place at schools and organizations in more than 80 countries around the world. 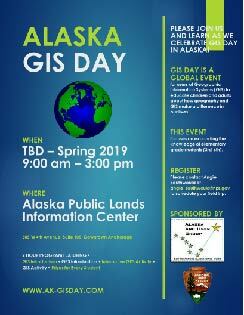 Please join us & learn as we celebrate GIS Day in Alaska! Alaska Arc User Group (AAUG) and National Park Service have traditionally held our AAUG Alaska GIS Day event in November at the Anchorage Alaska Public Lands Information Center (AAPLIC) in downtown Anchorage. This fall, the Anchorage Center is closed to the public from October 1 to April 2019 for a complete redesign and remodel of the center and exhibit space. Due to multiple factors, including space requirements and cost, we have determined that this facility best fits our needs and have decided to postpone this event until AAPLIC reopens in the Spring. At that time, we should enjoy warmer weather and a new and improved space for our event. Teachers, if you would like to be notified once the date is determined and event planning gets underway, please contact Angie Southwould to be added to the distribution list! Email angie_southwould@nps.gov to schedule your class field trip to Alaska GIS Day!